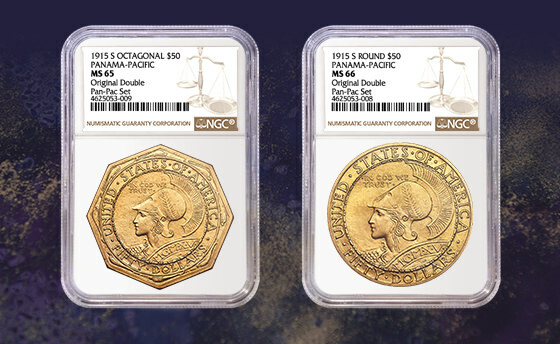 NGC has certified an extremely rare 1915 Panama-Pacific “Double Set.” The set, one of the most remarkable items in all of American numismatics, will be sold by Heritage Auctions in January. The 10-coin double set, created in 1915 for the Panama-Pacific Exposition, contains two examples of each of the five 1915-S Panama-Pacific commemorative coins, including the rare and impressive $50 gold pieces. Housed in a beautiful copper-and-glass frame with a velvet interior, the double set is truly extraordinary. It is also extremely rare; less than a dozen of these sets were sold, and even fewer have survived.